The camp will help to improve your child’s ability in dribbling, passing, control, and shooting while having fun and utilizing fair play. We have designed the camp to combine individual work with team oriented games to reinforce teamwork, and sportsmanship. 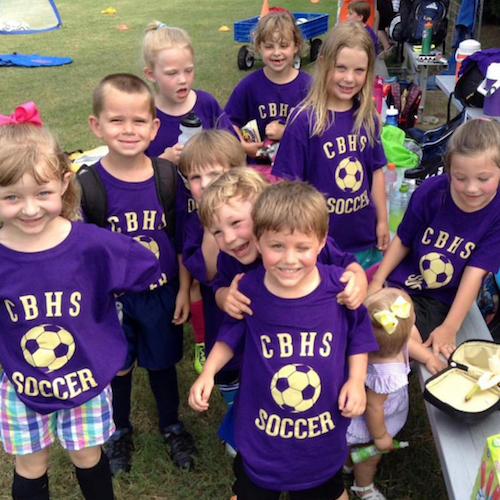 Each camper will receive a CBHS Camp Shirt and CBHS Water bottle upon registration. Gatorade will be provided along with popsicles daily. We will feature a water gun and water balloon party on Friday to conclude each week. This year we will be celebrating the 2019 FIFA Women’s World Cup in France. We will have themed days at camp in celebration of the tournament as well as prizes to be won during each week. TIMES: Drop off is 8:30am with pick up at 10am for 3-4 year olds and 11:30am for 5-13 year olds. Early drop off is 8am.